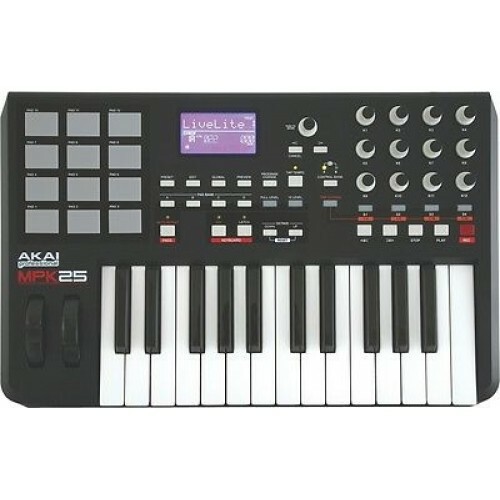 The Akai Professional MPK25 USB MIDI keyboard controller makes a perfect addition to your live or home studio setup! You get a very high-quality, 25-key keyboard with aftertouch for starters; this makes the MPK25 and your virtual instruments as expressive as you want to make them! 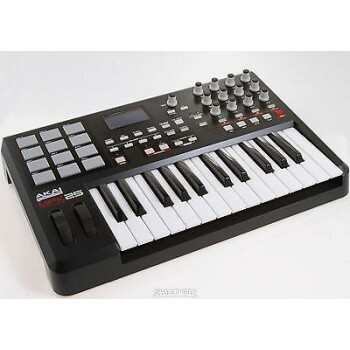 While this alone would make the MPK25 worth the price, the addition of 12 MPC-style velocity- and pressure-sensitive pads adds another dimension. an astounding 72 assignable controls make it easy to take command of your instruments and audio applications with the MPK25! The Akai Professional MPK25 features MPC-style Full Level and 12 Levels functions on its pads, and MPC Swing can be applied to both Note Repeat and Arpeggio functions. Tap Tempo and time-division buttons allow for real-time control of Note Repeat and Arpeggio clock speeds. 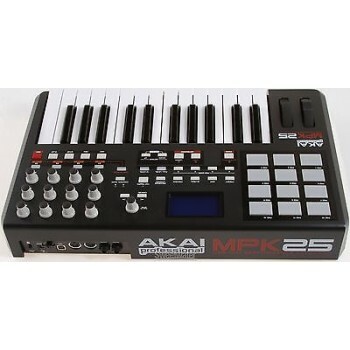 The MPK25 delivers an amazing 72 assignable controls, with assignable inputs that include an expression pedal, footswitch, pitch bend and modulation wheel.